National Feral Cat Day is a day set aside by Alley Cat Allies to help raise awareness and protect feral cats. What is a feral cat? 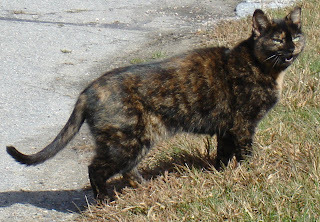 A feral cat is NOT a unique breed of cat. A feral cat is simply a cat who has not had the benefit of human socialization as a youngster. Hence, they fear humans and are generally happier living outdoors away from humans. The best things we can do for feral cats are as follows: spay/neuter them in order to prevent a next generation and provide food and shelter for them in the place they know as home. The Medfield Animal Shelter will join groups nationwide to mark National Feral Cat Day. On Monday, October 19th, working with volunteer trappers and the S.T.O.P. (Stop The Overpopulation of Pets) Clinic, we will spay/neuter approximately 30 feral cats. Once the cats recover from their surgery, they will be returned "home" where dedicated caregivers will continue to provide food and shelter for them. This is a photo of Ginger. She is a feral cat who has survived for years with no human contact. Caregivers have provided food and shelter for her but that was all. Suddenly she has decided she wants to be friendly instead of feral. It happens. But the outdoors will probably always be her home. We believe trap, neuter, return is the best method of population control for feral cats. If you are interested in learning more about what you can do to help feral cats in your neighborhood, please email medfieldcatlover@aol.com.